Want to contribute reviews or articles? Iowa City - "Pay attention. Watch it. Get back." Janet Schlapkohl, in her new play Coming of Age in Chore Boots, weaves those three concise phrases throughout the piece to reflect on what she learned growing up in the rural Midwest. The piece celebrates the farmer: the pragmatic survivor with the courage to weather the harsh Iowa winters and the tenacity to awake at dawn to do the work than needs to be done. It also tells the story of a girl growing up in this culture, at a time when the world around her was undergoing great upheaval. The piece starts with the story of being the batgirl on a softball team, an innocent enough occupation; but the way Schlapkohl describes the "missions" to dart in and come back with the bat alive, we see that she's going somewhere bigger. As the girls sing songs and gossip about their boyfriends on the way to Des Moines for the championship, we know with growing certainty when this is taking place: it's the mid-to-late '60s, and the Vietnam War cannot be avoided, even for a young girl. In her innocence, she has trouble grasping the implications; she loves the sound of "Tonkin" so she appropriates it for her own secret name; and she can only describe the faraway conflict as some large and dangerous game where the players come back in coffins. Hearing our history from such a perspective, we cannot help but yearn for the simple life of a midwestern farm, where your politics are less important than how close you stand to the machinery. "On the farm the rules made sense." The whole show interweaves the personal and the political in this way, creating an autobiography that is at the same time a history lesson and a reflection on what it means to survive, and to grow up, in this world. As Schlapkohl returns home from college, ready to start a family and become a farm wife like she's always dreamed, the Soviet/Afghan War breaks out, precipitating a grain embargo that cripples the American farmer. "I panted and breathed through the birth, and the farm crisis," Schlapkohl says, cradling the baby in her arms. She ultimately had to sell the farm, perhaps inevitable, perhaps a failure of not paying enough attention, but the lessons she learned are invaluable to her future. In the end, she learns to appreciate those times on the farm, and in the farming community, even when they were miserable and alienating. She draws a sharp distinction between "those in heels who are not what they seem" and "those in chore boots who offer quiet understanding." The story is both inspiring and endearing, and its storyteller no less so. Schlapkohl's script is very honest, blunt and direct, but it's also expertly crafted; everything is there for a reason, not a word is wasted, and the connections and metaphors are very satisfying. The one-woman show goes through a variety of styles and modes: at times, it's a simple, intimate reminiscence, as if we've been invited to tea; at other times we see a full-fledged scene in front of us, the stories being played out by Schlapkohl and a host of invisible scene partners. 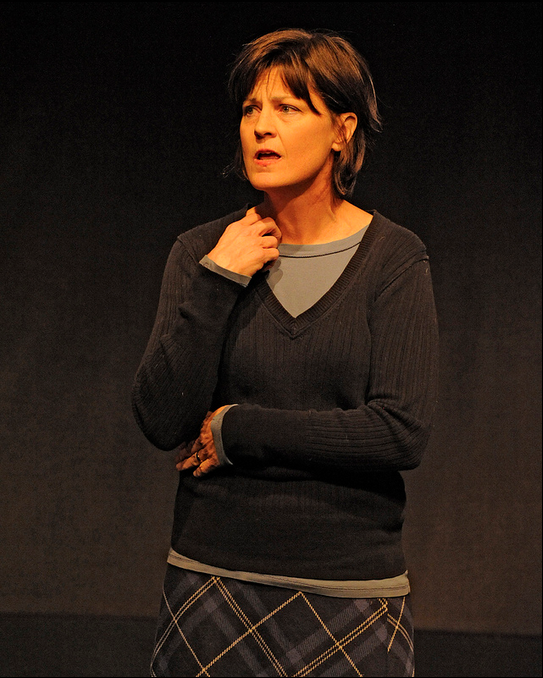 As a playwright, Schlapkohl knows how to make a personal anecdote into an engaging bit of theatre. As a performer, she knows how to bring it to life by her ability to physically embody everyone who is speaking, from a precocious child to a world-weary old woman to President Johnson himself. Riverside's production team supports her well, from Arthur Virnig's simple set, which gives us a rustic feel, to Drew Bielinski's lighting design, which sets the emotional tone perfectly, to the watchful eye of Tim Budd's direction, which keeps the piece moving both in terms of staging and pacing. It's always exciting to see artists come together to craft a new piece, and, following on the heels of Birth Witches, this is the second time Riverside has done so this season alone. Kudos to Riverside for taking a risk on a locally-crafted piece, and to Schlapkohl for making it worthwhile. Coming of Age in Chore Boots runs through December 8th at Riverside Theatre, 213 N Gilbert St in Iowa City. Tickets here.